Since I’m a strictly MP player I use mods which alter my truck and trailers legally using the Forerunner mod that was made for 1.32. i use the Day Cab plus 625hp in all trucks as well as a light modification mod that allows you to put multiple horns and lights in places. Watch where you click when you are downloading. They all work. The biggest file WILL take about 2 hours to download. REmember you have 1000's of people trying to download this. Do we activate the mod on sp or mp? Also where is this poll at? LOL I slip and slide all over the rode, even in my new Scania! The physics are there, at least for me. ^ That is great. There is sometimes I would be driving as a new player to ETS2 and Im driving and someone spawns inside me, and it throws me and my trailer across the map! Good morning Truckers, Staff and Developers! 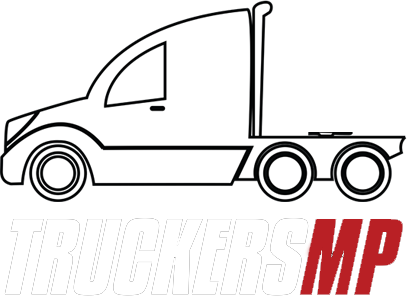 Since this new update to TruckersMP I have noticed some changes dealing with Ghost Mode. My company is BioChem Industries and we are part of Maersk Corporation with Big Apple Trucking & NY Logistics. My drivers have been experiencing this "Ghost Mode" when they log into the game and at random points in ATS. I personally have noticed this when I was playing ETS2 yesterday. Who else have noticed it? More importantly, What does it mean? Thank you! I think its stupid that you can;t put blue LEDs on the front of the vehicle with the Pilot paint job and the yellow lights. It will auto kick you from the server. I didn;t know those were considered Admin's stuff. I think that is ridiculous. Their ranks are closed.